Aspirinox Alloys Inc is one of the leading manufacturer supplier and exporter of ROCKSTAR 400 Plates. Rockstar 400 is a wear resistant rapidly cooled and tempered steel plate grade having an excellent combination of hardness, formability, weldability and toughness to meet all types of fabrication requirements. It was designed with relatively low carbon equivalent for better weldable properties. Rockstar 400 Abrasion Resistant Plates are mainly used for fabrication of crushers, liners for truck beds, buckets, hoppers, chutes, excavators and conveyor troughs, concrete mixer drums, trash truck bottoms, bucket lips, street sweepers and dump trailers and many other purposes. Rockstar 400 plates have obtained its mechanical properties by quenching which means cooling rapidly and when required by subsequent tempering. The new condition cannot be retained after service which exceeds a temperature of 250 degree Celsius. Rockstar 400 is not intended for further heat treatment. 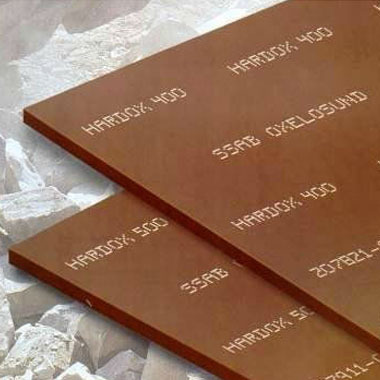 Rockstar 400 Wear Resistant Plates has a chemical composition of carbon manganese molybdenum sulfur chromium nickel silicon boron and phosphorus their composition percentage depends on the dimensions of the Plates used for various applications. The Rockstar 400 plates are delivered with thermally cut edges. Untrimmed edges can also be delivered after an agreement. Call us now and request a free quote! Specifications for Rockstar 400 Plates. If any specification is not mentioned here, please use the contact button for quick quote. Request the latest Rockstar 400 Plates List. Please click on the request a quote button or click here to request the updated price list and ready stock information along with your requirement. Aspirinox Alloys INC maintains a stock of all standard items and can export them at best price for Rockstar 400 Plates.